On our Pacific Northwest trip in 2011, we drove through Napa Valley on our way to Lassen Volcanic National Park, and thought it would be a crime not to stop by a winery. We chose Regusci Winery for its location on the less-crowded Silverado trail, its history (originally established in 1878 as the Grigbsy-Occidental Winery), and of course for its house corgi Trixie (our travel mates Emily and Jake are corgi-owners themselves). In addition to tasting some great wine, we highly enjoyed our personal tour of the cellars and winery (nothing like wine poured straight out of the barrel! ), and stayed afterwards for a picnic with sandwiches from the Soda Canyon Store just down the highway. 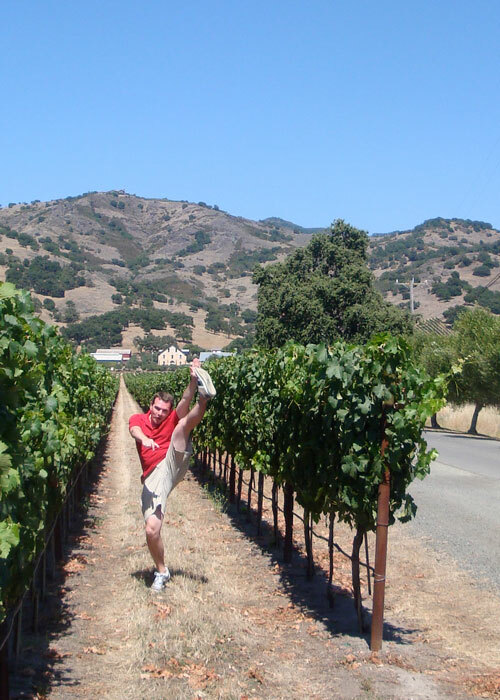 This entry was posted in High Kick Photos and tagged High Kick, Regusci Winery. Bookmark the permalink.